In the Fifth Congressional District, Congressman Steny H. Hoyer is a tireless fighter for economic development and a leader in creating jobs. He has helped create and save nearly 23,000 jobs by supporting federal facilities and associated businesses located in and around the Fifth District, including NASA Goddard Space Flight Center, Patuxent River Naval Air Station, the Naval Surface Warfare Center at Indian Head, the Beltsville Agricultural Research Center, the FDA at White Oak, and the future NOAA Center for Weather and Climate Prediction in College Park. He also works hard to protect our natural resources. In addition to supporting every major piece of environmental legislation while in Congress, he has co-sponsored numerous bills to protect the Chesapeake Bay and its tributaries, including the "Chesapeake Bay Restoration Act.” He secured more than $10 million in the 1990s to respond to Pfiesteria and to study its effects on humans; helped secure more than $400 million in the 2008 Farm Bill to enable farmers to implement environmental best practices and reduce runoff into the Chesapeake Bay; and championed the efforts to replenish the declining oyster population of the Bay and to restore the Potomac, Patuxent and St. Mary's rivers. Congressman Hoyer works to meet the transportation needs of his constituents by securing funding to maintain and improve local roads, commuter bus systems, and the Washington Metropolitan Area Transit Authority (WMATA). He also works to keep local communities and the Washington region safe by fighting to fully fund Community Oriented Policing Services, the Assistance for Firefighters Grant Program, and upgrades for first responders’ communications systems. Congressman Hoyer is also dedicated to outstanding constituent service. At offices in Washington, D.C., Greenbelt, and Waldorf, he and his staff help constituents cut through red tape and solve problems related to passports, immigration, government services, and a host of other issues. In Congress, Steny Hoyer has built an outstanding record of achievement and earned a reputation as a strong leader and an able legislator. In the 111th Congress, his skill at consensus-building helped the House pass important legislation to strengthen our economy and bring health coverage to an additional 4 million low-income children through the State Children’s Health Insurance Program. He has also been one of Congress’s leading voices for fiscal responsibility and a government that pays for what it buys, and he has spearheaded an effort to invest in creating new jobs in Maryland and across the country through Democrats’ Make It In America plan. Congressman Hoyer shepherded the Americans With Disabilities Act (ADA) to overwhelming approval in the House in 1990. This landmark civil rights legislation, signed into law on July 26, 1990 by President George H.W. Bush, has helped millions of disabled Americans enter the workforce, achieve independence and go as far as their talents take them. In 2008, Congressman Hoyer also led the effort to pass the ADA Amendments Act, which allows millions of Americans with disabilities to benefit from the ADA’s original intent of inclusion. Congressman Hoyer also gained wide acclaim for guiding the Help America Vote Act to House passage and producing a House-Senate Conference Report that was signed into law by President George W. Bush on Oct. 29, 2002. Washington Post columnist David Broder called this comprehensive election reform legislation "the most significant piece of election law since [the] Voting Rights Act." In addition, Congressman Hoyer drafted and helped secure passage of the Federal Employee Pay Comparability Act (FEPCA). FEPCA, which was signed into law in November 1990, was a major effort to restructure the pay system for Federal employees, which attempts to ensure fairness in pay and comparability to similar work outside the Federal government. Congressman Hoyer also is a widely respected voice on foreign policy and international affairs. As the former Chair and Ranking Democrat on the Commission on Security and Cooperation in Europe (the Helsinki Commission), he championed the cause of human rights, individual freedoms, democracy and religious liberties throughout the world. He called for decisive U.S. and NATO action to stop the carnage throughout the former Yugoslavia and condemned the repressive tactics of Afghanistan's former ruling regime, the Taliban, and recognized the danger posed by that government before the terrorist attacks of September 11. He also has taken a very active role in urging international action to stop the genocide in Sudan, and in April 2007 led a Congressional delegation to Darfur. On May 21, 2009, Denmark honored Congressman Hoyer by making him a Knight of the Order of the Dannebrog. Through his committee assignments and leadership positions, Congressman Hoyer has aggressively advocated for his Fifth District constituents and also is a respected voice on national and international issues. As a member of the Appropriations Committee from the time he took office until he entered the Congressional leadership, Congressman Hoyer has secured funding for numerous important projects in Calvert, Charles, Prince George’s, Anne Arundel, and St. Mary's counties and throughout the State of Maryland. He also has worked to ensure that the military bases in the Fifth District not only survived base closings but grew and thrived. On the Transportation, Treasury and General Government Appropriations Subcommittee, Congressman Hoyer became widely recognized as a national leader on issues affecting Federal employees and retirees. In addition to guiding FEPCA to passage, he fights year in and year out for fair pay and benefits for Federal employees, and he has secured funding for telecommuting centers that save money and reduce traffic congestion. He also has been a strong proponent of Federal law enforcement efforts that fall within the Subcommittee's jurisdiction, securing funding for innovative crime-fighting projects such as the High Intensity Drug Trafficking Area Program, Gang Resistance Education and Treatment Program, and the Youth Crime Gun Interdiction Initiative. In addition, he is a long-time supporter of the COPS on the Beat Program, which has meant more than $30 million in Federal funding to hire an additional 700 police officers in the Fifth District. On the Appropriations Subcommittee on Labor, Health and Human Services, and Education, Congressman Hoyer championed education and funding for the Class Size Reduction Initiative, Head Start, and teacher training programs. He has also been an advocate for increased funding for childhood immunization and for full-service community schools, which provide a range of important services for students, especially in early childhood years. Congressman Hoyer is well-recognized for his efforts to make the House more efficient and "customer friendly.” As the former Ranking Democrat on the Committee on House Administration, which oversees the internal operations of the House, he played an important role on policy issues ranging from election reform and campaign finance reform to enhancing the security of the Capitol complex in the aftermath of September 11. As House Majority Leader for the 116th Congress, Congressman Hoyer is the second-ranking member of the House Democratic Leadership. He is charged with mobilizing the party vote on important legislation, acting as a liaison between Members and the Democratic Leadership, and coordinating strategy within the Caucus. He also plays a key role in shaping House Democrats’ legislative priorities and in delivering the Democratic message. Congressman Hoyer's experience, know-how, and strong work ethic have led to increasing responsibilities within the House Democratic leadership. He previously served as House Majority Leader from 2007 to 2011 – which made him the highest-ranking Member of Congress from Maryland in history – and House Democratic Whip from 2003 to 2007 and in the 112th,113th, 114th and 115th Congresses. Prior to serving in his first term as Whip, Congressman Hoyer served as Chair of the Democratic Caucus – the fourth-ranking position among House Democrats – from 1989 to 1995. He is the former Co-Chair (and a current member) of the Democratic Steering Committee, and served as the chief candidate recruiter for House Democrats from 1995 to 2000. Congressman Hoyer also served as Deputy Majority Whip from 1987 to 1989. Now in his 20th term in Congress, he also became the longest-serving Member of the U.S. House of Representatives from Maryland in history on June 4, 2007. Congressman Hoyer attended Suitland High School in Prince George's County, and in 1963 he graduated with high honors from the University of Maryland, selected "Outstanding Male Graduate” that year. In 1966, he received his law degree from Georgetown University Law Center. That same year, at the age of 27, he won a seat in the Maryland Senate. In 1975, he was elected President of the Senate, the youngest ever in state history, and served in that body until 1978. He was a member of the State Board of Higher Education from 1978 to 1981, the year in which he came to Congress after winning a special election. 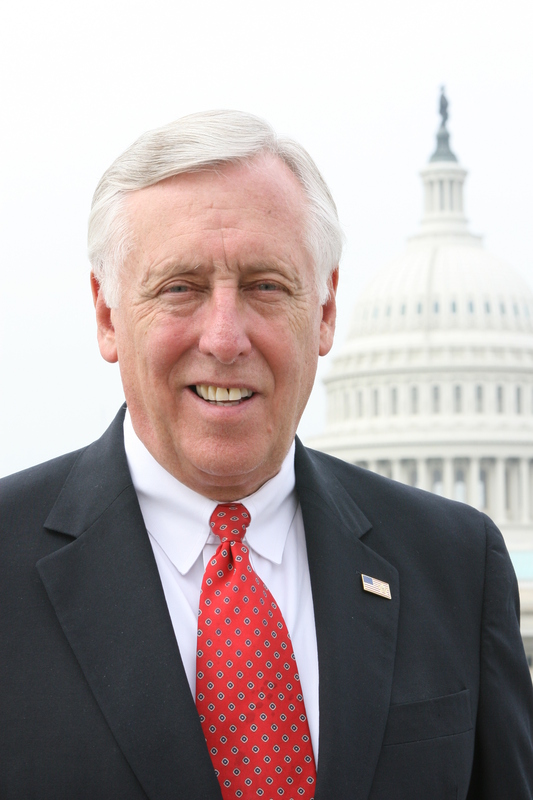 Congressman Hoyer currently serves on the St. Mary's College Board of Trustees. He also is a former member of the Board of Regents of the University System of Maryland and the United States Naval Academy Board of Visitors. Congressman Hoyer and his wife, the late Judith Pickett Hoyer, have three daughters: Susan, Stefany, and Anne; son-in-law Loren Taylor; grandchildren Judy, James Cleveland, and Alexa; and great-grandchildren Ava, Braedon and Brooklyn. Click here to view this biography in Spanish.